Journalism has an impact on history, and history has an impact on journalism. The line between the two areas can blur, as seen in “A Report from the Borderland Between History and Journalism,” written by Jeffrey Wasserstrom and Ian Johnson. Both professions can enhance their work by learning from each other, by establishing networks that connect them, by sharing expertise and by sharing practical knowledge about media and methods. Historians, Journalists and the Challenges of Getting It Right debuted January 6, 2012 in Chicago at the 126th annual American Historical Association conference. A partnership of the Lear Center, USC Annenberg’s Center for Communication Leadership & Policy, and the American Historical Association’s National History Center, Getting It Right begins with the premise that both professions, historians and journalists, are in the business of finding and assessing evidence; of analyzing events; and of narrating events. Both are storytellers. Both could enhance their work by learning from each other, by establishing networks that connect them, by sharing expertise and by sharing practical knowledge about media and methods. 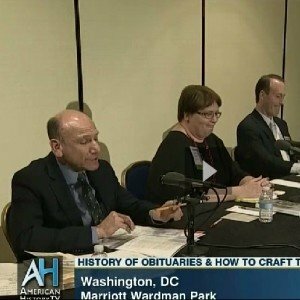 Lear Center Director Marty Kaplan moderated this panel at the 2014 conference of the American Historical Association, as part of the Historians, Journalists, and the Challenges of Getting It Right project. “The Art and Craft of the Obituary” looks at obit writing from the perspectives of those who write them as well as historians who must use them as a resource.